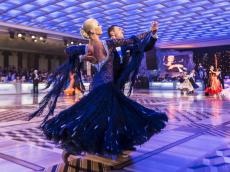 The State Kremlin Palace will host the main event of the year in European dances among professionals - World Cup 2017 on October 2017. Azerbaijan will be represented by talented dancers Eldar Jafarov and Anna Sazhina at the championship. This elegant couple always stands out among others on the dance floor, with their passion and gracefulness. Incredibly talented dancers always conquer the public and judges with their unique performances. Their desire to share happiness and art with the viewers made Azerbaijani couple one of the most popular and beloved by the Russian public. They are always warmly received in the Kremlin. Now, dancers prepare for the Moscow World Cup with special diligence. The organizer of the WDC tournaments is Stanislav Popov, Honored Artist of Russia, President of the Russian Dance Union, Honorary Vice President of WDC. The World Cup is an open tournament with a large list of participants, including up to 70 pairs. The championship will welcome dancers from more than 30 countries of the world. As part the event, the Kremlin Cup will be also held among amateurs of Latin American dances. This is an invitation tournament, and usually, it brings together over 20 strongest duets not only many countries. Professional dancers will demonstrate a variety of European dances renowned for their elegance and beauty. Rich and colorful program awaits dance lovers.